Our post The Five Bone Broth Mistakes You Might Be Making was very popular. I received many questions about it, so I decided to follow it up with more mistakes and more information to answer many of the questions I have received. It takes time for the minerals and nutrients to be drawn out of the bones. If you stop before this happens, you won’t be getting everything you need and waste nutrients by throwing them into the garbage instead of drawing them into the stock. 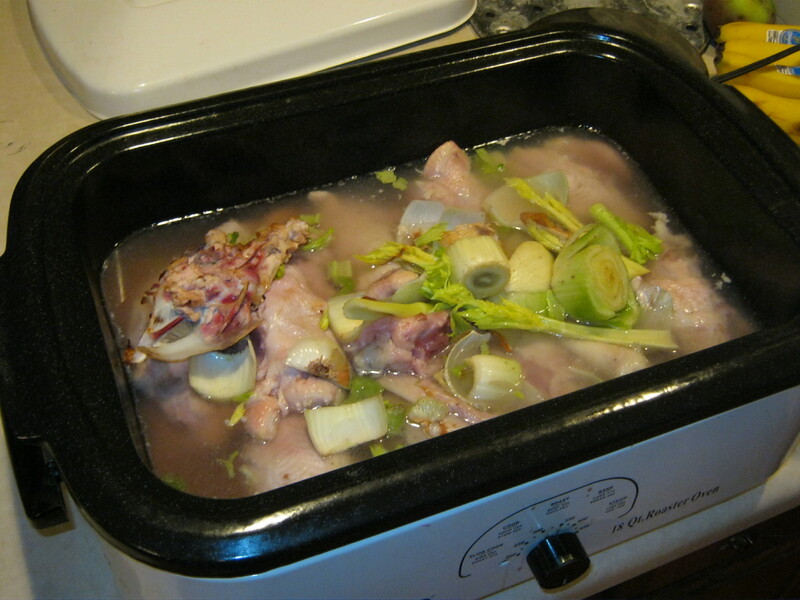 Cook stock a minimum of 8 hours, but go for 24-36 hours for chicken and 24-48 hours for beef if at all possible. The longer, the more nutrition you extract, generally speaking. But there is a limit to how long cooking remains beneficial. If you let stock go too long, it can turn and the broth can become bitter or have off flavors. If you go longer than 36-48 hours, depending on how high you have your heat, you can have the flavor turn. Sometimes, you can tell the flavor has turned by the color of the broth. If it turns unnaturally dark, you’ve probably cooked it too long. If you’re doing a ‘continuous brew’ type of set-up where you remove stock and add bones and water daily, make sure you check it daily to ensure it’s doing ok and doesn’t need to be pulled. It’s important to avoid aluminum when making stock. Aluminum can leech under heat and long cooking conditions, and you don’t want that in your stock! Stainless steel or cast iron are good choices, as is enameled cast iron. Remember, the heavier-bottomed the pot, the better heat distribution you get, which will avoid a burnt or off-flavor developing from hot spots if you’re cooking on the stove. It’s also important not to use an under-sized pot. Crowding can mean you don’t wind up with as rich of a stock as you desired. Gelling is awesome, but if you cook your stock a long time in order to extract all of the nutrients from the bone, don’t be surprised if the stock doesn’t gel. The gelatin has broken down from the long cooking time. It’s still there, it’s just broken down so it’s more easily absorbed. If you’re really concerned, you can take your stock and add some high quality, commercially purchased gelatin to it. Or you can pop in some chicken feet the last few hours of cooking to give it some gel. Either way, gelled or not, bone broth is still awesome. Using fat after a too long cooking time can be a problem because the fat can go rancid. If you wish to reclaim the fat, use a ladle skim the fat once it has liquified and pop it into the fridge to solidify. If you miss any fat and you find it after cooking, be sure to discard that fat before use. This method has a good and a bad. It’s good in that you can claim the fat and use it. It’s bad, however, in that a nice, thick fat cap on the stock can make it last longer in the fridge. So to compensate, plan on using your stock quicker or freeze it for long-term storage so you don’t accidentally miss the window and it goes to waste. Also, I’ve been known to add the fatty trimmings from chickens in order to bulk up the fat content in the stock, so I could have it both ways- ladle some off for cooking and keep the rest so the stock could have a protective fat cap. Either way, be sure to store your stock in the coldest part of your fridge so it will last as long as possible. about how long will it last in the fridge? 3-7 days in the fridge. Longer with a nice, thick fat cap. That’s what I thought -thanks! Thank you. I had a chicken bone broth taste awful and wasn’t monitoring my continuous crock pot brew enough. Now I understand what went wrong and will also watch the color. It makes sense. Thanks for the great info. Lately I keep reading that people are making bone broth in a pressure cooker, that only takes 20 minutes. What are your thoughts on using a pressure cookers? I use one when needed, yes. However, I don’t believe 20 minutes is long enough. I personally go for an hour. I love this website! I just have a quick question… I’m just about to start my 2nd batch of bone broth, but my 1st with beef bones. Should I soak them in the water/ vinegar mix first, or should I bake them in the oven to get the maximum benefits 1st? You can roast them, cool, then soak in the water and vinegar mixture. That gives the maximum nutrition and the best flavor and color. so, i cooked my broth too long or too high and the flavor turned. can i still keep the bones for a second batch, or do i need to toss them with the broth? Amber, you can go ahead and try with a second batch. Sometimes it works, sometimes it doesn’t. I read on the WAPF website that broth can simmer up to 72 hours. Is this wrong? I have always done about 2 days, and I did 3 with my first batch of beef broth. I have done a lot of chic broth, but new to beef broth. I did roast the bones. Can I use them again like I do with the chix broth? How do I know if it has turned? And how do I know if the fat is rancid from cooking too long?? Can I start cooking the broth and then put in the fridge and then resume again later? I often find I don’t have enough 8-hr blocks to cook broth. Betsy, you can. Another option is to use a crock-pot. What are your thought about suitable instant pot for making this? I made some and cooked it 1 hr and 20 minutes it turned out good I thought. Teresa, I now use the Instant Pot exclusively for making stock. I adore mine! I am currently cooking stock in the instant pot, using beef bones. It smells good, but it’s very pale. Any idea why this is or how to darken it? Roast the bones before you cook them. Roasting darkens the stock and makes it look like what you would expect coming from a carton. It also deepens the flavor. I am burning my broth in the slow cooker. I cook on low for 24 hours. It stinks and is brown. I don’t understand what I am doing wrong. Carroll, it’s possible your crock-pot cooks at too high of a temperature. Newer crock-pots tend to cook a lot hotter than the older ones. It boils constantly instead of simmering. Does it taste burnt?